Detailed orbs and rings of medium to dark greens and bits of azurite make this dainty freeform chrysocolla pendant a beautiful addition to your wardrobe. Set in sterling silver and fine silver and adorned with silver bubble accents and an iridescent patina to make them pop. 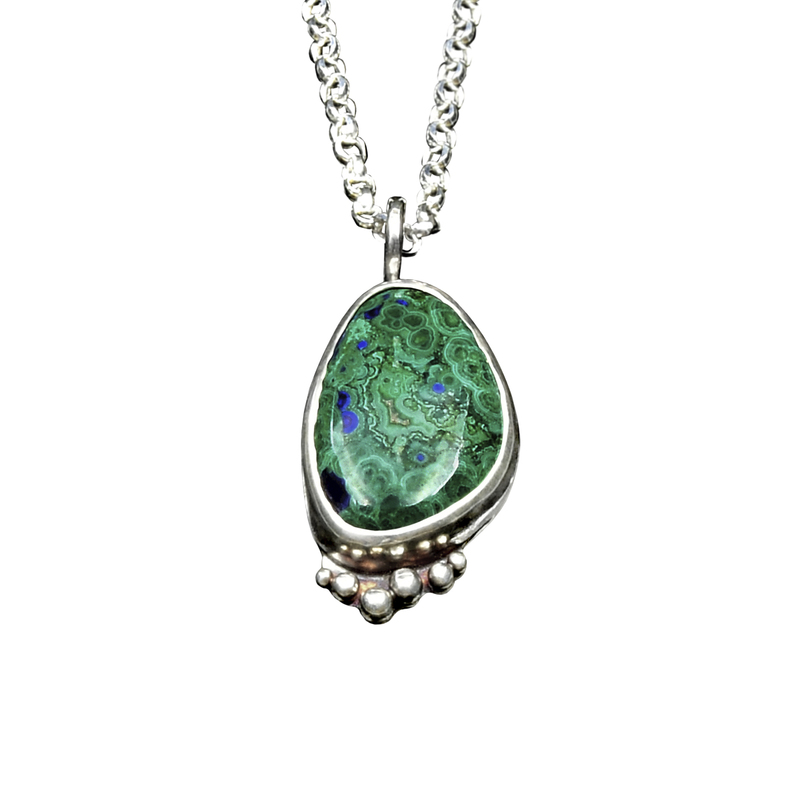 Lovely on its own or layered with other pendants and chains. 3/8″ wide by 3/4″ long. Your choice in length of finished sterling silver chain is included. Shown layered with our Seashell Pendant. Chrysocolla occurs naturally in multicolored sky blues to bluish-greens. It occurs in many important copper deposits, and the copper in its chemical structure is responsible for the blues and greens. It often contains inclusions or veining of black and brown matrix material. It is also often coated by a druzy layer of glossy, clear quartz or intergrown together with quartz. It is a softer stone and care should be taken when wearing jewelry containing it. Chrysocolla is found worldwide, and significant sources include Africa, Israel, Australia, Peru, Chile, Mexico and the united states. The most outstanding chrysocolla has come from many of the classic Arizona copper mines, including the Inspiration mine, Globe-Miami District, Gila County; the 70 Mine, Hayden, Gila County; Morenci, Greenlee County, and Ray, Pinal County. The locality of Ray is especially noted for its beautiful and intriguing stalagmites combined with Quartz.